I bought this as a Christmas gift as my sister entertains a lot. Don't know how she likes it yet. But looks real nice. Keep food warm and fresh tasting with the help of these serving trays by Le Chef. 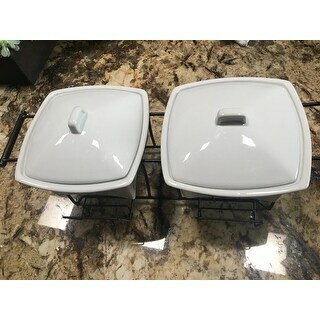 The ceramic trays are great for serving a variety of foods and are safe in the microwave, dishwasher, and refrigerator for superior convenience. I just received my ceramic serving trays and very happy with them. They are smaller than what i had envisioned, but they will be perfect for gatherings and game nights. The metal rack is sturdy and the ceramics will double as serving “bowls” without the rack. So far very happy! These serving trays are awesome, I have used them for several gatherings at our home. The simple tea light candle heating is super convenient for keeping dips and appetizers very warm. Trays are made of very good quality. These are great serving trays for all your favorite dishes! Love love these ceramic servers. They are sleek and modern looking and holds a lot. 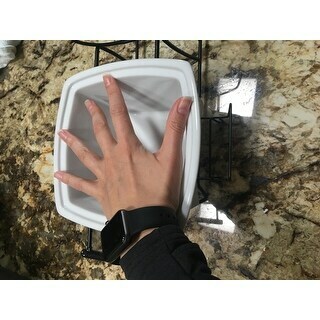 I used them for hot and cold dishes as well as for chips and dip. High quality and washes clean easily. Highly recommend this product for the price. I love this serving tray - it is just the right size for serving two hot dips or keeping the veges hot while the rest of dinner gets ready. They are attractive and go with many different styles of décor. I purchased this so I can keep food hot longer, without constantly reheating or putting in microwave. I love this item. I will probably order another set, but I must definitely recommend. Love them! Used for a baby shower- warm crab meat dip in both. Will use again! Like two dishes for Thanksgiving or Christmas: gravy on one side, candied yams on the other. I like that I did not have to find an outlet to plug another serving dish into! Venues can be stingy with outlets! 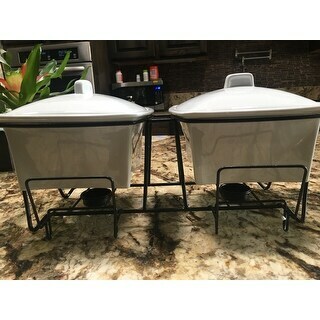 Very happy with my Le Chef warmers...classy and elegant look. I bought this product as a gift for my aunt and uncle, who host Christmas Eve dinner at their house very year. Considering the wonderful spread they put out every year, it seemed fitting to get these serving trays for them for the holidays. Hope they like it! 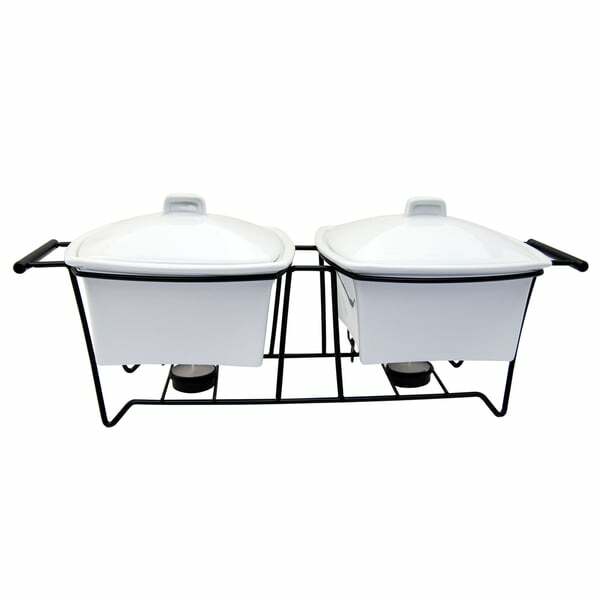 Besides food sticking to bottom, this piece is perfect for catering or just a family gathering to keep food warm. Added elegance to my gathering. Perfect, great size. Durable and functional. I love the quality but I was expecting something larger, but I will Keep them. Very nice set. Great to keep warm to items and takes minimum space on table or counter top. Easy to handle – there is handle on each hand for easy grip. "Are these free of toxic chemicals like lead, cadmium, ptfe, pfoa, arsenic, etc. that can leach to food?"